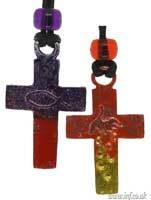 Coloured pewter cross with a grape motif on one side an Ichtus on the other and a coloured bead above. Designed and cast by us. On a 20'', 50cm long 1.5mm bootlace cord with a clasp.